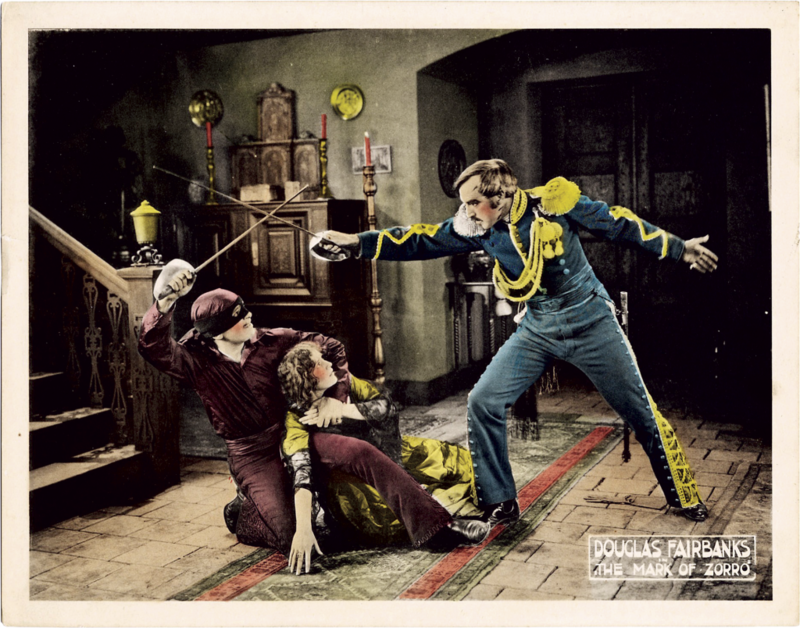 The Mark of Zorro is a 1920 silent adventure romance film starring Douglas Fairbanks and Noah Beery, Sr.. This genre-defining swashbuckler adventure was the first movie version of The Mark of Zorro. Based on the 1919 story “The Curse of Capistrano” by Johnston McCulley, which introduced the masked hero, Zorro, the screenplay was adapted by Fairbanks (as “Elton Thomas”) and Eugene Miller. The film was produced by Fairbanks for his own production company, Douglas Fairbanks Pictures Corporation, and was the first film released through United Artists, the company formed by Fairbanks, Mary Pickford, Charlie Chaplin, and D. W. Griffith. The character Sgt. Pedro Gonzales (Noah Beery, Sr.) was later transformed into Sgt. Demetrio Lopez Garcia (Henry Calvin) by the Disney TV series with Guy Williams as Diego/Zorro, who was renamed Don Diego de la Vega. Noah Beery, Jr. makes his first of many dozens of screen appearance spanning six decades. Of course he portrays a young child; his father began sporadically billing himself as Noah Beery, Sr. as a result. The film has been remade twice, once in 1940 (starring Tyrone Power) and again in 1974 (starring Frank Langella). In 2015, the United States Library of Congress selected the film for preservation in the National Film Registry, finding it “culturally, historically, or aesthetically significant”.